With “The Beast” having arisen from the multiple personalities of Kevin Crumb (James McAvoy) a number of times, David Dunn (Bruce Willis) intensifies his hunt of the extraordinarily powered serial killer. However when their epic confrontation is interrupted, both find themselves housed in a maximum security mental institution undergoing treatment for a very specific form of delusion, that of believing to posses superhuman powers. There they undergo intensive therapy, along with a third individual that Dunn has previously encountered, that of Elijah Price (Samuel L. Jackson), a villainous mastermind that goes by the name Mr Glass. Well, as the old saying goes Glass is half full, or half empty, depending on your point of view. The final in M. Night Shyamalan’s superhero trilogy (following from Unbreakable and Split) is typical of his previous works, and will certainly divide audiences. It’s a slow, carefully constructed piece that dissects the superhero genre in an almost clinical fashion, teasing out the power fantasies and character archetypes that make these stories such a powerful part of pop culture. Shyamalan also takes great care in executing this vision, granting a sense of realism to the unbelievable (albeit let down by one or two shonky effects). He uses careful framing, rather than being reliant on expensive effects, often having the action not taking pride of place in the center stage of the picture, but rather off-center or in the background. The result is unusually subtle, keeping with that subversion of expectations that has run the course of the entire series. That same philosophy is often brought to the narrative. Although he plays with grander ideas and themes, those are often subverted or suggested. 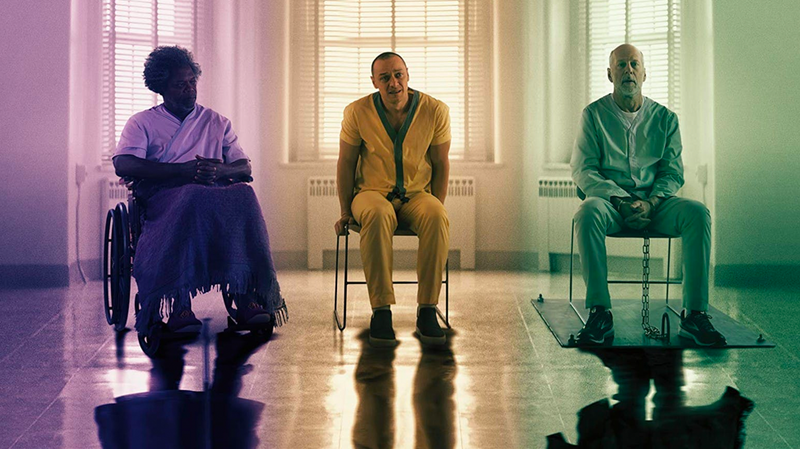 Enticing and frustrating in equal measure, Glass does not go for the overblown climax with the same gusto of a DC or Marvel outing, rather overturning audience expectations. That is also its greatest weakness, and the Kryptonite that threatens to undo all of M. Night Shyamalan’s work as a director – his gimmicky use of the “twist”. Without giving details, there is such a twist at the heart of Glass, and its poor execution and lack of a solid foreshadowing, threatens to undo the entire film. Hence Glass is a bit of a clunky mess, as it tries to meld the somber tone of Unbreakable with the pulp luridness of Split, but still a somewhat intriguing one. The decades might have robbed the discussion about Glass of some of its sting, as both comics and superhero films have shifted since Unbreakable, but it is still a noble intention to do something more with the genre than a simple morally unambiguous dialectic opposition of good versus evil. It’s also served well by the trio of actors acting as the main dynamic relationship. McAvoy’s over the top performance in tackling the multitude of personalities in the DID suffering Kevin Crumb, pairs nicely with Willis’ understated Dunn. Both of which allow Jackson’s Glass a measure of a puckish glee, as he pitches the two forces against each other. By this stage of the game, you really should know what to expect from a director like M. Night Shyamalan, for both good and ill, and Glass fulfills those expectations. It makes a satisfactory conclusion to the tale started with Unbreakable, but it is certainly an imperfect one.